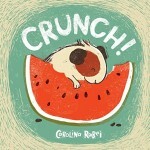 Crunch is a lovely story about friendship, sharing and new discoveries. The cover illustration immediately intrigued us – a guinea pig eating a watermelon – we just had to read more! The Story: Crunch, a guinea pig, loves eating. Although he has a comfortable life with plenty of food he has a feeling that something is missing, he’s just not sure what. One day he’s visited by a mouse, Cheddar, but Crunch refuses to share his food even when Cheddar offers him a hug in exchange. Cheddar leaves and later Crunch leaves his hutch for the first time to look for him. He doesn’t find Cheddar but gets a surprise when he gets home. Crunch has all the material things that he needs but when Cheddar appears he instigates a turning point in Crunch’s life. During the story Crunch discovers a wonderful world beyond his cage as well as the meaning of sharing and friendship. Cheddar is a skinny little mouse but it’s only after Crunch rejects Cheddar’s hug, sends him away (and finishes breakfast!) that he starts to become concerned about where the mouse could be and whether he could be in danger. His imagination goes into overdrive which spurs him to leave his familiar cage. Outside his cage Crunch discovers a world he didn’t know existed including butterflies, flowers and new smells. There is very little text in the story, much of it is shown through the pictures. Carolina Rabei has used earthy colours for the illustrations, mainly greens, oranges and browns (when I talked to my daughter about them she went through the book trying to find blue and purple in the pictures!). The colours suit Crunch’s laid back personality and I find them very soothing for a bedtime story. I love the fruity endpapers, they’re predominantly white with a variety of fruit and vegetables (complete with bite marks). I also like the final illustration which shows Crunch and Cheddar sharing a lettuce leaf, my daughter’s favourite picture shows Crunch eating watermelon for breakfast (also the cover illustration). Crunch would be a great book to use in the classroom to stimulate a discussion about sharing, friendship, how we treat other people and how we feel about new experiences. As part of a topic on food children could identify the fruit and vegetables on the endpapers and discuss their favourites as well as find out what guinea pigs and mice like to eat. A lovely story which reflects the fears that children may have about new experiences or making friends. We particularly like the names Crunch and Cheddar, they are so apt for the characters. Thank you to Child’s Play books for sending us a review copy of Crunch. We enjoyed reading it and there is lots of potential for using the book for learning. Thank you sharing this lovely story. I will find this book in our local bookstore so I can read it to my sons. My firstborn is very shy and does not like going out so this story might encourage him to try to make friends. Sending love from the #WeekendBlogHop! What a lovely sounding book! It includes several themes that are relevant to young children. Crunch! is a very cute story and the themes of friendship and sharing are very relevant to toddlers!